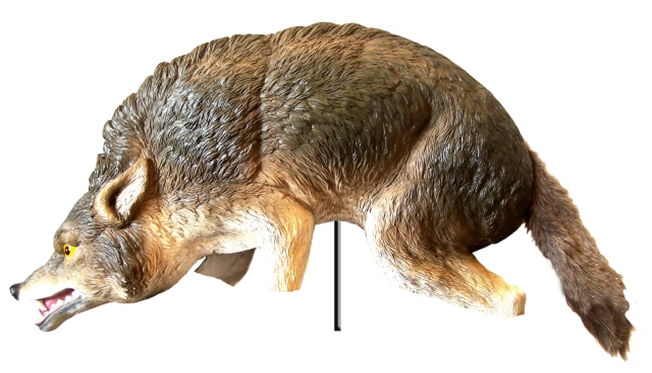 The 3D replica of the predator coyote allows for visibility from every angle. The moving fur tail also contributes to the lifelike appearance. As pest birds can spot the predator from afar, they are forced to find other safe and untreated areas. Works to repel unwanted birds, geese, ducks, and other waterfowl that would see the coyote as a potential predator. By relocating the unit regularly, the coyote will increase in effectiveness. By forcing out unwanted pests, there is a cut in recurring cleanup and repair costs. In addition, health and liability risks that are associated with animal infestation are reduced. Your property will not only look aesthetically better, but it will decrease nuisance for fellow residents, workers, customers, or more. This deterrent has the ability to be visible across up to one acre of land. The 3D structure also allows the decoy to be effective at 360 degrees. This makes it ideal for areas such as parks, golf courses, sports fields, corporate grounds, airport property, and more.